If you picked up Legion of Super-Heroes: When Evil Calls, Paul Levitz's third collection of his recent Legion revival (post-Infinite Crisis, pre-the DC New 52), chances are you're a Legion fan or at least willing to be faced with the years of Legion continuity that Levitz unapologetically packs into this story. None of the three books have shied away from references to Legion stories past, but When Evil Calls takes the extra step of picking up on Legion Academy plot threads that are twenty years old if not older, treating them as if they just happened last issue. This will no doubt be some fun for devout Legion fans, but it indicates strongly that Levitz has given up any semblance of working for a broader audience, instead catering mostly to those "in the know." 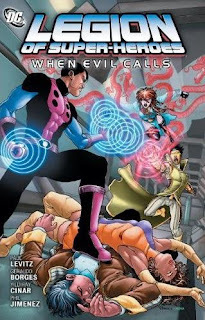 If none of that scares you off, When Evil Calls is a fair conclusion to Levitz's pre-New 52 Legion trilogy (Levitz continues as Legion writer into the New 52, as well). Levitz ties up most loose ends and gives good closing character arcs to the prominent characters of his run so far, even addressing a bit of what previous writer Geoff Johns left behind. If anything, how neatly Levitz wraps up the story is the strongest indication of the pre-New 52 rush to close before Legion is relaunched with yet another new issue #1; those who've stuck with the book thus far, however, aren't likely to be disappointed. This volume finds the Legion confronting a being of personified evil, unleashed after an immortal professor tries to view the creation of the universe. In DC mythology, this opening of Pandora's box is usually attributed to the mad Green Lantern Guardian Krona, but Levitz bends it with a Legion twist. This is heady stuff -- Levitz, having been with DC for more than thirty years, uses as a matter of course material from Crisis on Infinite Earths and earlier that younger writers wouldn't touch and many new fans probably aren't even aware of. It sets, from the outset, the bar for entry to this volume rather high, and that's even before Levitz weaves in parts of the Shazam mythology and the various interpersonal relationships between Legionnaires and their enemies the Legion of Super-Villains. Guessing, perhaps, that if the Legion title is still afloat then it must be because of long-time Legion fans, Levitz throws accessibility to the wind here and writes a story that specifically rewards knowledgeable DC Comics readers. If that would seem an unpopular choice in today's marketplace, consider that When Evil Calls is in many ways a throwback to Levitz's classic Legion: Great Darkness Saga. Like the recent deluxe Darkness collection, Evil is long (fourteen issues, which dwarfs most DC trade collections) and digresses heavily, both in the enjoyable but not-quite-relevant Legion Academy story, and in the series of repetitive battles between Legionnaires and Legion of Super-Villains recruits. This latter part is specifically evocative of Darkness -- the Legion fights the Super-Villains over multiple pages just as they did (over and over again) Darkseid's minions in Darkness. Levitz's Legion books are always a toil, but happily so -- to read Evil is not to just spend just an hour with these characters, but rather a couple of days really with them. Evil is more a novel whereas some of the recent DC New 52 collection premieres have only been appetizers. Though DC unfortunately messed up the order of the issues collected in the last book, Legion: Consequences, Evil is constructed brilliantly -- first comes five issues of Adventure Comics, a self-contained story about the Legion Academy, then the Super-Villains special, and then the last two issues of Adventures are interspersed with issues from the Legion title as both the heroes and the trainees deal with the Super-Villains. It's also in this way that Evil feels like a novel -- it has plenty of set-up as well as the main action and the epilogue; the first volume Choice and Consequences both factor heavily, but Evil also feels full and self-contained in its own right, years of continuity notwithstanding. Though the Legion Academy aspect is not imperative for the main Legion story (though it's great to see Phil Jimenez's superlative art gracing Legion pages), what's most interesting about it is that Levitz takes the opportunity to show a different side of the Legion. None of the Legion Academy characters becomes a Legionnaire by the end, and some are actually specifically rejected or shunted to other work. The Legion comes off as elitist, and there's a significant amount of discontent among the Academy students. You don't have to choose, but if I did, it might be the Legion Academy that I'd want to keep following -- they are younger and edgier, but also the Legion Academy's thirty-first century is less utopian, suggesting perhaps a certain blindness on the part of the "adult" Legion to their real surroundings. I believe Levitz continues some Academy members into his New 52 Legion series and I'm glad for this -- it would offer a perspective one doesn't see in Legion stories alone. Whether Professor Harmonia Li, the Green Lanterns of the thirty-first century, new Legionnaire Earth Man, and Geoff Johns's time-lost Starman were all originally meant to come together at the end of Levitz's third Legion trade is doubtful, but Levitz ties up all of their plot threads satisfactorily. I was surprised, as a still-relatively "newbie" Legion fan, that Levitz does not use Cosmic Boy, Saturn Girl, or Lightning Lad in his pre-DC New 52 Legion conclusion. These are the most popular and recognizable Legionnaires, however, and perhaps Levitz doesn't use them specifically, giving the book's ending over to the favorites of true fans rather than to the masses. This would be more significant were Legion truly ending, but of all the DC New 52 titles, Levitz's moves almost the most unscathed into DC's new continuity. The conclusion is one of hope, suggesting the Legion will continue, and it's nice even if not as significant as similar sentiments expressed in the final appearances of the pre-DC New 52 Batgirl Stephanie Brown or the pre-DC New 52 Wonder Woman, for instance. I love continuity, even though it's popular to thumb your nose at it these days, and Legion of Super-Heroes: When Evil Calls is where continuity still thrives, a book heavy with Legion and DC Comics history that's actually heavy -- collects a lot of issues -- in its own right. This is not a book I'd give to every reader, but it's one I'm glad someone at DC sees fit to publish, and hopefully the DC New 52 Legion brings more of the same. Later in the week, our first look at the DC New 52 Legion of Super-Heroes with Hostile World. See you then! The fact that Levitz's Legion books have mostly been ignoring reboots and whatnots have always amused me. I mean, they're pretty far off into the future, why should they be bothered by Barry Allen rewriting history or Superboy Prime punching the multiverse? Anyway, looks like a fun read, I'll be sure to give it a look!